Playlist for June 30, 2010 - Independence Day Special! The playlist for the June 30, 2010 broadcast of the Swing Shift Shuffle has just been added to the playlist filing cabinet. 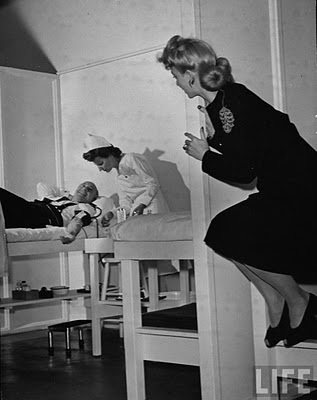 The Hollywood stars came out to support the troops during World War II, and a Life magazine photographer captured several shots of folks like Carol Landis and Cecile B. DeMille (left) doing their part in a 1942 blood drive. Film Noir Photos has several shots posted. This morning's Sunrise Serenade was definitely swingin': "Reet, Petite And Gone" by Louis Jordan. Click on the song title for the album page on emusic. Sample clip at Disc 3, Track #25. The weekly Red Hot Lindy Hop lesson and session continues this Friday night with a lesson by Kirk and Amanda, and music by Amanda. Free admission before 7:00 p.m., and $5 at the door afterwards. Live music later this month! album page on emusic. Sample clip at Disc 2, Track #12. Predictability is definitely not an element of Random Harvest. There are enough plot twists to make Alfred Hitchcock blush, and it is these twists and turns of fate that take this movie beyond merely a sugar coated three hankie tear jerker. Well, it finally happened. This morning's Sunrise Serenade was, in fact, "Sunrise Serenade" by Glenn Miller. Click on the song title to listen courtesy of Jazz On Line. 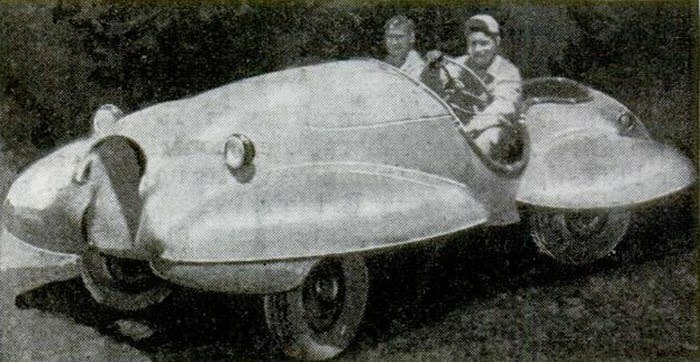 “They made a racer type body from the cowling of a C-46 engine, fashioned fenders out of emergency gas tanks and wound up with a speedy little runabout,” the article stated. Details, of course, were sparse, indicating only that the 478th was stationed in the Philippines at the time. This morning's Sunrise Serenade took me on a trip to the Orient with "Nagasaki" by Valaida Snow. Click on the song title to listen courtesy of Jazz On Line. Are You An "Ickie" Or Really "Alreet"? Now you're talkin! 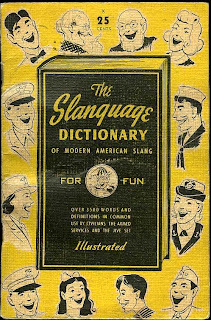 The Boat Lullabies posted a scan of a few pages from The Slanguage Dictionary of American Slang from 1944. 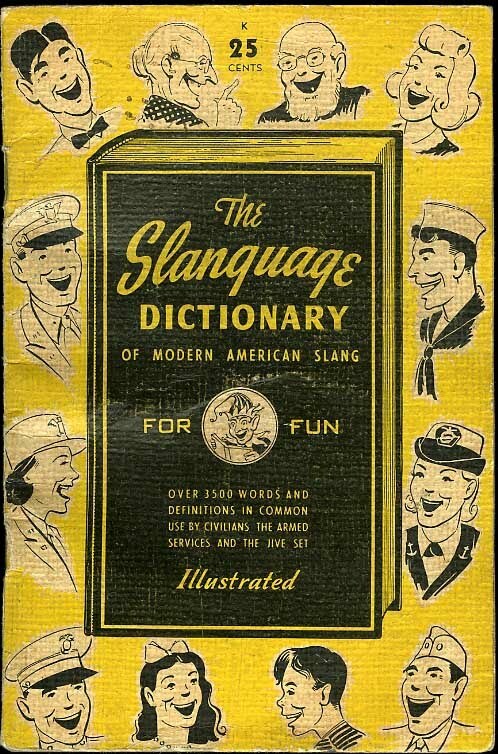 With this helpful little tome handy, you need never worry about being a "drip." This morning's Sunrise Serenade was "Mad For A Pad" by Anita O'Day with Stan Kenton and his Orchestra. Click on the song title for the album page on emusic. Sample clip at Track #21. 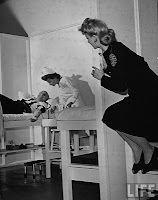 The playlist for the June 23, 2010 broadcast of the Swing Shift Shuffle has just been added to the playlist filing cabinet. 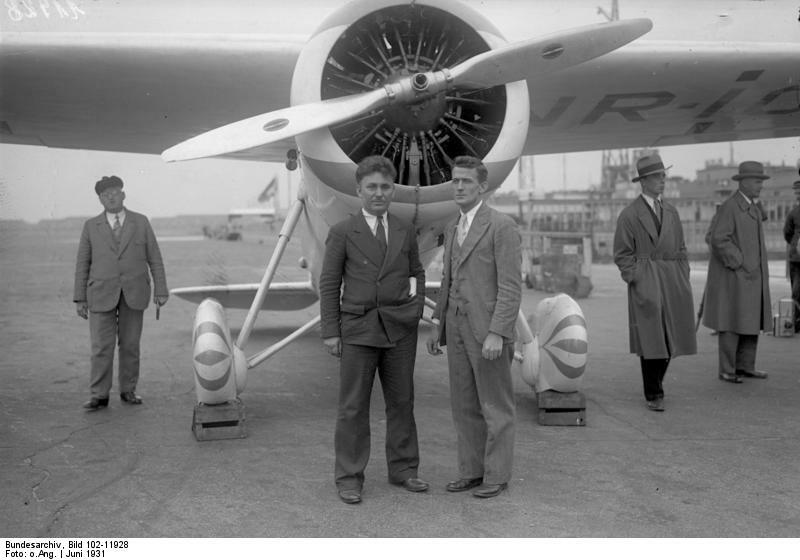 On June 23, 1931, Wiley Post and his navigator, Harold Gatty, took off in their single engine monoplane, the Willie Mae, on their attempt to beat the record for flying around the world. They succeeded by returning their starting point on July 1, after 8 days, 15 hours and 51 minutes. The previous speed record was set by the dirigible, Graf Zeppelin, in 1929 with a time of 21 days. Post and Gatty were the first to set the record in a fixed wing aircraft. The People History also notes that Lena Horne recorded the "St. Louis Blues" on this date in 1941. Cab Calloway was on the move in this morning's Sunrise Serenade: "Gotta Go Places And Do Things." Click on the song title to listen courtesy of Jazz On Line. Jayna Morgan & the Sazerac Sunrise Jazz Band return to the Rumba Room to provide live music for your dancing pleasure at Friday's Red Hot Lindy Hop lesson and session. The lesson by Kirk and Tamar starts at 7:00 p.m., and the band plays from 7:30 to 9:30 p.m. There is a $7.00 band cover. You can hear some of Jayna's recordings on her MySpace page. This morning's Sunrise Serenade had an uptempo groove. It was "Boogie Woogie Stomp" by Albert Ammons. Click on the song title to listen courtesy of Jazz On Line. On June 19, 1948, Columbia Records unveiled its 33 1/3 rpm "LP" record, the first long playing phonograph record to actually be successful after other record companies failed in their earlier attempts. 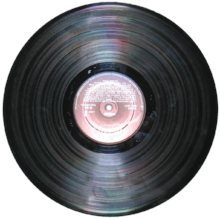 Prior to the LP, the most prevalent format was the 78 rpm disc, which held only 4 minutes of music per side. That limitation is why most recordings from the swing era are less than 4 minutes. With the LP, music fans could listen uninterrupted for up to 25 minutes each side. The early Betty Boop cartoons always seem a bit weird by today's standards, but this one features a Lewis Carroll-like twist in that, like Through The Looking Glass, it revolves around a game of chess. From the Internet Archive, here is the 1932 animated short, Chess Nuts. 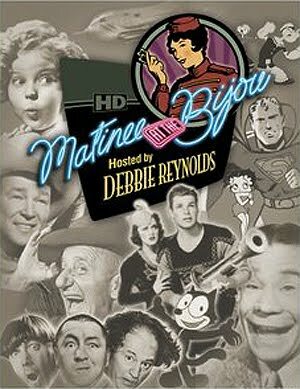 When I was just reaching my teens, I happened across a TV show on PBS called Matinee At The Bijou. This show recreated an afternoon at the movies from the 1930s, complete with cartoon, serial and main feature. I clearly remember sitting at my grandmother's house watching Laurel and Hardy in Saps At Sea on her console TV. Occasionally, I have sinced wondered what happened to that show. This morning, while clicking through some blogs, I discovered that Matinee At The Bijou has a new home online as a blog, with links to a viarety of old movie, cartoon and serial resources. 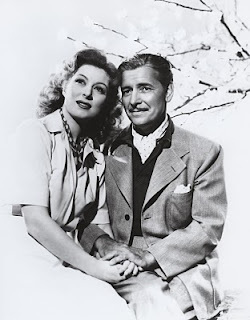 The blogger is not exactly prolific, but there is definitely enough material to make me smile, including this video showing part of the original TV show opening theme, sung by Rudy Vallee no less. This morning's Sunrise Serenade was "Air Conditioned Jungle" by Duke Ellington. Click on the song title for the album page on emusic. Sample clip at Disc 1, Track #8. 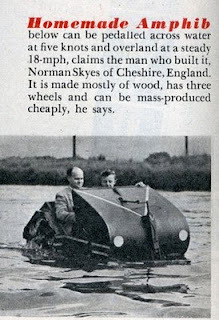 Over at Modern Mechanix appears this nice little item from 1947 about an enterprising Englishman and his home-built, pedal-powered amphibious vehicle. This morning's Sunrise Serenade was "On The Alamo" by the Four Vagabonds. Click on the song title for the album page on emusic. Sample clip at Track #6. The playlist for the June 16, 2010 broadcast of the Swing Shift Shuffle has just been added to the playlist filing cabinet. If you are a Cary Grant fan, you are in luck this week during the Orpheum Summer Movies series. Tomorrow night, Grant, Katherine Hepburn, and James Stewart engage in class warfare in The Philadelphia Story. On Friday, Grant and Eva Marie Saint hang around Mt. 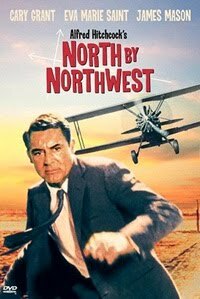 Rushmore (literally) in Hitchcock's North By Northwest. 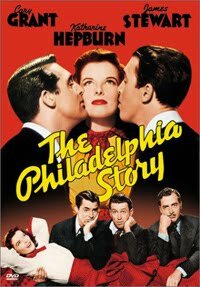 I like Cary Grant, but for me, Jimmy Stewart steals the show in The Philadelphia Story. My funniest moment? When Stewart responds to an awkward question from Hepburn about marriage with the stunned query: "Can she be human?" Today's Sunrise Serenade was "F.D.R. Jones" by Judy Garland. Click on the song title for the album page on emusic. Sample clip at Track #2. The regular Red Hot Lindy Hop lesson and session continues this Friday night with a lesson by Mike and Jeska, and music by Jeska. Free admission before 7:00 p.m., and $5 at the door afterwards. Live music later this month! 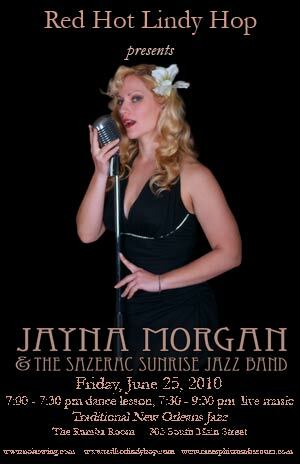 Next week, Jayna Morgan & the Sazerac Sunrise Jazz Band return to the Rumba Room to provide some live music for your dancing pleasure. Listen to the music on her MySpace page. This morning's Sunrise Serenade was "Moanin' Low" by Lena Horne. Click on the song title for the album page on emusic. Sample clip at Track #12. (d) The flag should never be used as wearing apparel, bedding, or drapery. It should never be festooned, drawn back, nor up, in folds, but always allowed to fall free. Bunting of blue, white, and red, always arranged with the blue above, the white in the middle, and the red below, should be used for covering a speaker's desk, draping the front of the platform, and for decoration in general. . . .
(g) The flag should never have placed upon it, nor on any part of it, nor attached to it any mark, insignia, letter, word, figure, design, picture, or drawing of any nature. . . .
(i) The flag should never be used for advertising purposes in any manner whatsoever. It should not be embroidered on such articles as cushions or handkerchiefs and the like, printed or otherwise impressed on paper napkins or boxes or anything that is designed for temporary use and discard. Advertising signs should not be fastened to a staff or halyard from which the flag is flown. . . . Apparently continuing a theme set by Saturday's cartoon post, today's Sunrise Serenade was "Small Fry" by Bing Crosby, backed by Tommy Dorsey and his Orchestra. Click on the song title to listen courtesy of Jazz On Line. Taking its title and background music from the song of the same name, this cartoon features a fish that does not want to school. From the Internet Archive, Fleischer Studio's 1939 animated short, Small Fry. The Orpheum Theatre's Summer Movie Series begins this weekend. In addition to more contemporary films, there will be a number of classics, including The Philadelphia Story, North by Northwest, The Wizard of Oz, and Casablanca. 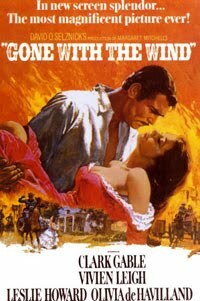 Although the series opens tonight with the relatively modern Ferris Bueller's Day Off, the real, classic big screen movie category begins tomorrow night with Gone With The Wind. The Gypsy Hombres At Otherlands Saturday Night! Peter Hyrka and the Gypsy Hombres return to Otherlands Coffee Bar on Saturday, June 12, 2010, starting at 8:00 p.m. Cover is $10, and in my humble opinion, very well worth it. Below is a sample of the heptitude you can experience. Today's Sunrise Serenade was "I Can't Believe That You're In Love With Me," by Chattanooga's own Valaida Snow. Click on the song title for the CD page on Amazon. Sample clip on Disc 2, Track #9. The playlist for the June 9, 2010 broadcast of the Swing Shift Shuffle has just been added to the playlist filing cabinet. Of all the Disney characters, Donald Duck is one of my favorites. As noted by The People History, he made his film debut on June 9, 1934 in Walt Disney's The Wise Little Hen. This morning's Sunrise Serenade was "Ko Ko" by Duke Ellington. Click on the song title to listen courtesy of Jazz On Line. The Red Hot Lindy Hop lesson and session continues its weekly schedule this Friday night with a lesson by Matthew and Amanda, and music by Amanda. Free admission before 7:00 p.m., and $5 at the door afterwards. Live music later this month! This morning's Sunrise Serenade was "Benny Rides Again" by (who else but) Benny Goodman. Click on the song title to listen courtesy of Jazz On Line. A grand "Ole!" 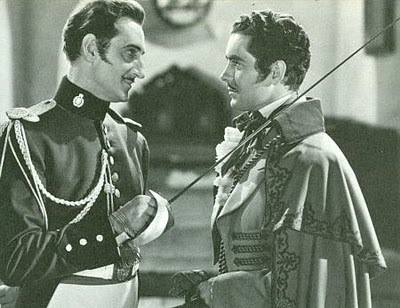 to Classic Movies Digest, which did a great article on one of my favorite movies of all time, The Mark of Zorro (1940), starring Tyrone Power, Linda Darnell, Basil Rathbone and Gale Sondergaard. I particularly appreciate the recognition of both Rathbone and Power as accomplished fencers. Today's Sunrise Serenade was "Judy" by Hoagy Carmichael. Click on the song title for the album page on emusic. Sample clip at Track #20. Popeye, Bluto and Olive Oyl try to comply with orders to "cut out the rough stuff" in this possible response to the Hays code restrictions on violence. The quality is not the best, but it is worth the watch. 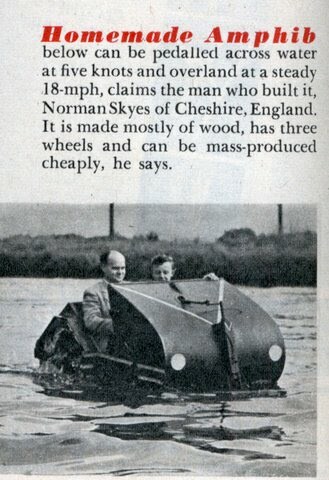 From the Internet Archive: It's The Natural Thing To Do. 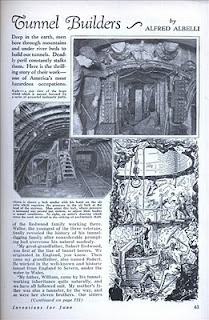 It is hard to imagine the challenges, both technical and dangerous, that faced the workmen who dug the underground traffic tunnels in New York in the 1930's. 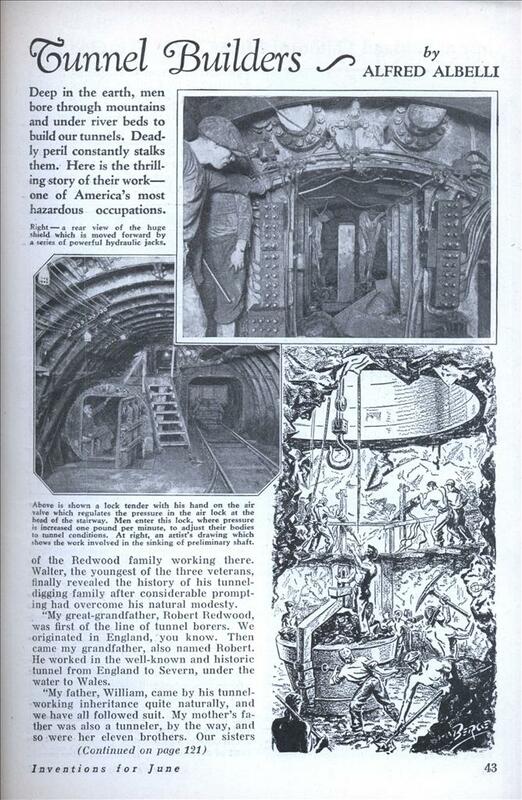 Modern Mechanix gives you a look into that world with its post of the 1934 article Buried Alive with the Tunnel Builders. The Golden Gate Quartet returned for this morning's Sunrise Serenade with "Pray For The Lights To Go Out." Click on the song title for the album page on emusic. Sample clip at Track #12. I used to associate the Road Runner with the 1960's, but as Chuck Redux noted, Chuck Jones directed his first Road Runner & Wile E. Coyote cartoon Fast and Furry-ous in 1949. The site posted this original model sheet from the short. I like it when musicians incorporate instruments that seem otherwise outside their genre. Today's Sunrise Serenade was an example: "Special Delivery Stomp" by Artie Shaw, featuring that bastion of swing band instruments, the harpsicord. Click on the song title to listen courtesy of Jazz On Line. The playlist for the June 2, 2010 broadcast of the Swing Shift Shuffle has just been added to the playlist filing cabinet. The weekly Red Hot Lindy Hop lesson and session continues this Friday night with a lesson by Jaredan and Michelle, and music by Jaredan. Free admission before 7:00 p.m., and $5 at the door afterwards. This morning's Sunrise Serenade was "Why Doesn't Somebody Tell Me These Things" by Glenn Miller and his Orchestra, with Marion Hutton on vocals. Click on the song title for the album page on emusic. Sample track at Disc 2, Track #3. "It's a bird! It's a plane! No! It's Superman!" 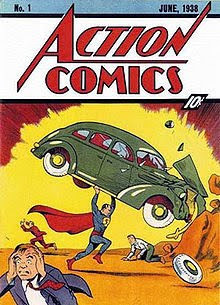 On June 1, 1938, as noted by The People History, readers got their first sight of the Man of Steel in Action Comics Issue No. 1. This strange being from the planet Krypton has been around ever since, fighting for truth, justice and the American way. Today's Sunrise Serenade was "Don't Sit Under The Apple Tree (With Anyone Else But Me)" by Glenn Miller and his Orchestra. Click on the song title to listen courtesy of Jazz On Line.